In 2012, I made an online purchase for the Holy Cow! 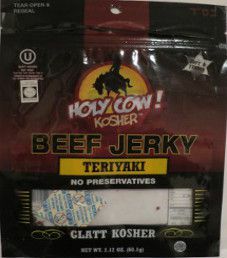 Kosher brand with this 2.12 ounce/60.1 gram bag of teriyaki flavored beef jerky. The brand name is Holy Cow! Kosher. Kosher beef is used, meaning the food is allowed for consumption under Jewish dietary guidelines. The aim is for a Rabbi to slaughter the animal, limiting the amount of pain the animal will endure.